Experts share insights on the importance of supporting teachers and learners. EDC’s Pam Buffington, Shelley Pasnik, and Jim Stanton were invited presenters at the Expanding Computing Education Pathways (ECEP) Summit last week. 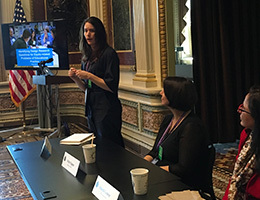 Held at the White House and George Washington University, the summit marked the first time that the 17 states leading state-level, systemic computer science (CS) education reform came together to share their work and meet with researchers who can inform their efforts. 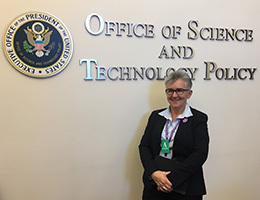 In the October 28 session “White House Symposium on State Implementation of CS for All,” Buffington and Pasnik presented during the panel, “Finding the Sweet Spot: What Problems of Practice Are Ripe for Knowledge Generation?” Buffington provided insights on researcher-practitioner partnerships drawn from her experience as a co-PI of the Research + Practice (R+P) Collaboratory, while Pasnik shared lessons learned from EDC’s work, including the need to support CS teachers as learners. On October 29, Stanton served on the panel, “How State Context Impacts Reforms in CS Education” and also delivered a “state of the state” summary focused on CS education systemic reform in Massachusetts. EDC’s participation in the summit was an important extension of its work to ensure all students can access high-quality CS learning. With over $27 million in investments from state, federal, foundation, industry, and higher education partners, EDC has initiatives underway to support teachers, build systems, and advance knowledge of effective programs, policies, and practices to close CS opportunity gaps.